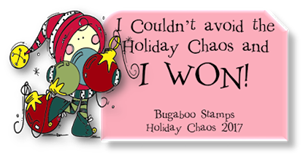 I had a wild week and am late for my Bloggers Challenge card......I also wanted to make a card for the D2D digi challenge in order to earn a free image for next week. (I have been playing along since December...if you make a card with the free image the first week of the month, you get another free image each week if you play and post a card to the website). These two cards are mirror image- and I think they look so different! I used SU DSP and decided on a Yellow and Red color theme. The image is colored with Copic markers and I used Crystal effects on the cherries and in the centers of the flowers. 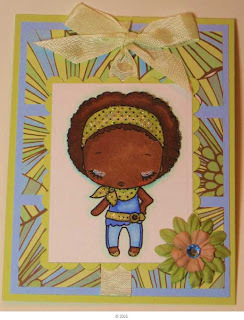 Blog hop for FCD Singing about L-O-V-E!!! 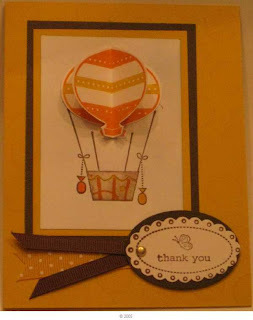 Welcome to the February Firecracker Designs by Pamela Blog Hop, where the Design Team is singing all about L-O-V-E-!!! That was not too hard for me, as my 23rd Wedding Anniversary is this Sunday! The Blog Hop officially starts Friday at 8AM, so if you arrive early, the links may not all connect yet. AAAAwwwwww isn't that sweet??? The sentiment reads, " If I had a rose for every time I thought of you, I'd walk in a garden forever". 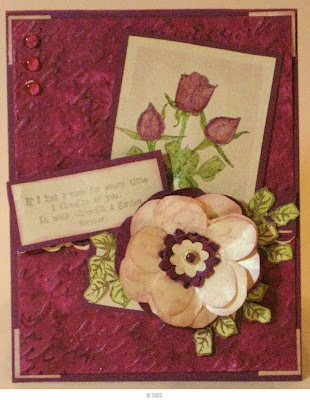 Stamps are Paper Roses by Firecracker Designs by Pamela. The background technique by the Technique Junkies- first I used 'Dabbed Shimmers', then 'Cuttlebug Highlights'. (That BG paper started out white......). Roses were colored with reinkers and the aqua brush, then highlighted with SU markers, and 'Whisped Edges' done on the main panel. 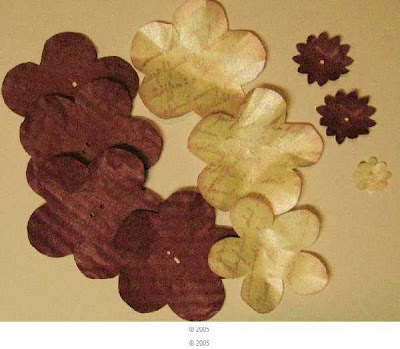 The smaller leaves and gold embossed on White CS, and water colored, then carefully cut out. Next, I punched out some flowers using Rich Razzleberry SU CS and Poison Ivy Iridescent paper and I stamped it with German Script from FCD. I put the layers together and used a brad in the center. The Sketch is MoJo Monday. 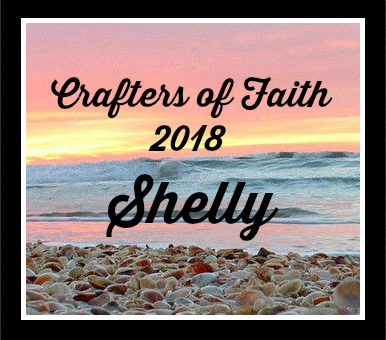 On to the BLOG HOP! This is a circular Blog hop- keep hopping until you come back to where you started! There is a prize- only Pamela knows where it is.........so, leave a comment on each blog for a chance to WIN! 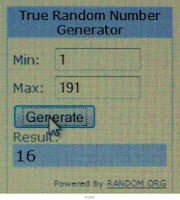 To check and see if you won, check Pamela's blog on Monday. Thanks so much for stopping by today! Hope you enjoyed my card! 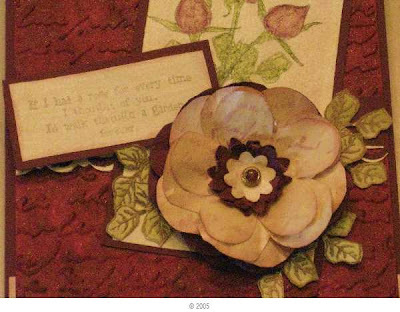 and #3 48 Lorraine- will be receiving the crocheted flowers. What fun- I was a winner, and wait until I post pictures of what I won -I won two things...... and I am so excited I am in Heaven!!! This is a scissor fob-since I do alot of needlework...or have a few aaaahhhhmmmm unfnished projects to work on- this is perfect for me. Sadie does a variety of stitching- here is her blog link. And, I won a beautiful 8 x 10 collage from an artist in Australia- I am going to have it framed and have just the spot for it! Here is the blog link if you want to take a peek. Have a Great day and thanks for participating and/or stopping by! 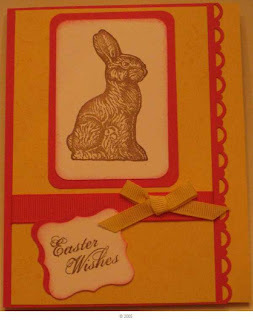 I have been enjoying this new stamp set introduced last month by Firecracker Designs by Pamela called Got Chocolate? 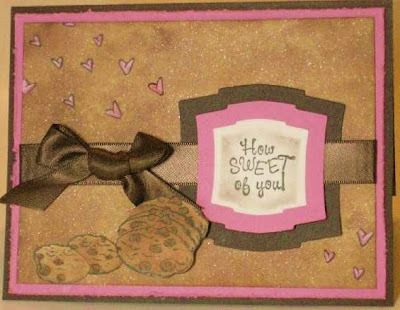 I like Milk Chocolate...... and it is an invite to use Pink and Brown CS together and not use a Valentine..... I have my new TJ newsletter, and have been playing with a technique called Dabbed Shimmers (can you see the shimmer in the BG)? And, Wisped Frames on the main sentiment. Do you love the new SU Satin ribbon??? I really enjoy using it! 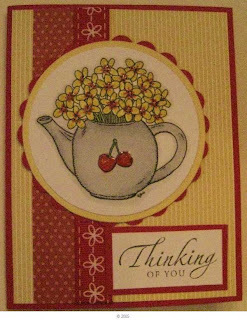 I think this card is a great card to send a friend instead of a Thank You card for dinner invites or for someone that does something nice for you. While I was Dabbing Shimmers.......I decided to whip up a set of ATC's- I used the same stamp set by Firecracker Designs by Pamela, and the same two techniques by the Technique Junkies I used Close to Cocoa )sparingly) and Creamy Carmel for the shimmer. 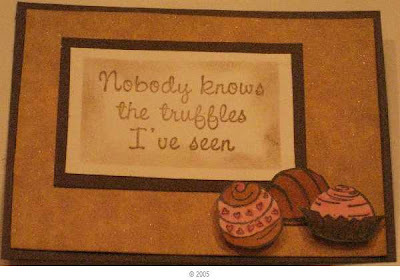 I colored the truffles with Copic markers. I used Copics: E33, E35, E37, E49, R81, R83, R83. 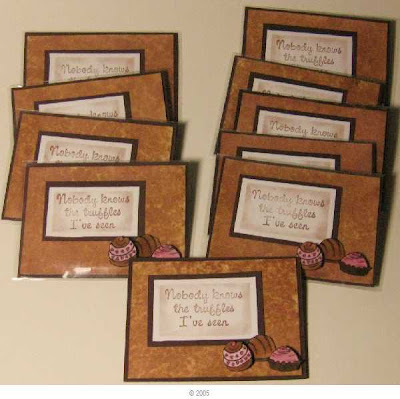 This set of ATC's will be in the mail on the way to Juliet A's for the TJ ATC swap! I am trying to send one set a month, and this is my Feb Set. Here is a template for cutting ATC's out of an 8 1/2" x 11" piece of paper. We have a slew of Birthdays in my family at the end of Feb. and all throughout March. In fact, my older sister was born 3/9, next year a brother 3/4, next year another brother 3/9 (again)...and I came a year later....in April.....Whew! Did I mention my sister has a birthday at the end of Feb.? Dad is in March too- we either have quarterly birthdays or eat alot of cake- that is our March dilemma!!! I used SU in-color Melon Mamba to color the scallops on the cake, and Pretty in Pink Flowers with rhinestone centers. The bee's are colored in Barely Banana and shimmerz painted on the wings. I painted Silver shimmers on the platter as well. There is a touch of Barely banana ink on the candle tops and a dot of shimmers over that- does not show well in this photo. (I get my shimmerz at Firecracker Designs By Pamela). I used Nestabilities for the sentiment. I tried Whisped Frames from the new TJ newsletter, but flubbed it up....but I am not totally unhappy with the card. My entire computer crashed this week- last week it was the e-mail....My husband got my computer running, but it is bare minimum- no Word or anything....... I have lost all of my e-mail contacts and all of my photo's- I had all of my digi images in my photo files. Well, I now own a Flash drive! Woo Hoo! This is a post I wanted to share about Mary G's niece-Mary is of my Blogging friends and here is a link to her BLOG. A little over 2 years ago, Mary's family lost their 31-year old niece, Julie, to cervical cancer. She fought a long hard battle, but in the end, she lost her fight. She would have turned 34 on February 2nd. In her memory, Mary will donate $1.00 for each comment that she receives on her blog during the month of February to the American Cancer Society. 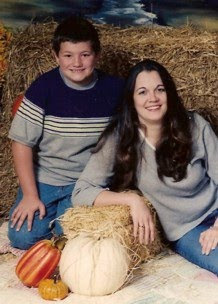 Mary's son, Brian, is captaining a team for our local Relay for Life event and she will donate that amount to his team. Please help her out by commenting often. If you would like to make a personal monetary donation, please visit Brian’s personal fundraising page here. Thanks for your support! Hope you can stop by Mary's blog and comment! Here I am at the last minute making my D2D card......I had a killer headache earlier in the week, so no stamping, then working...... I got out the Copic Markers tonight- all browns, and whipped up a card and an ATC to meet the deadline for posting. Designed2Delight offers a FREE digital image the first week of the month, and if you submit a card, you get the next week's image FREE. If you did not play the week before, you can purchase the image and jump in the fun of receiving Free weekly images. This week the image was these 2 Owls- my daughter is in a Sorority at Ohio State University- the Sorority Mascot is an Owl. 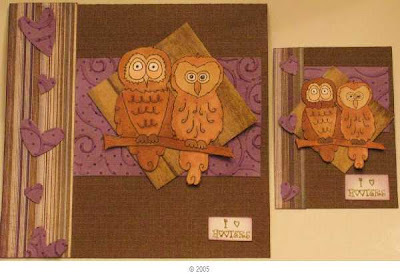 I love making her cards and sending them to her- they are called Little Hooters when they are chosen for the sorority- I know....but look at the sentiment I found to go on the card. 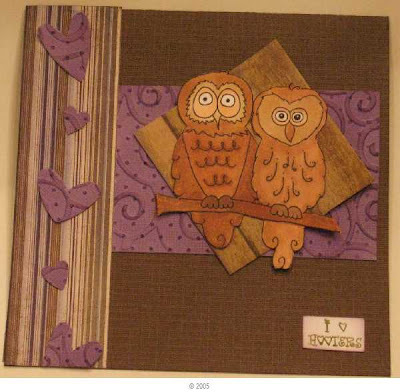 I also made a matchnig ATC for a challenge blog called Fun with ATC's that was just started up- this week the theme is Purple and brown. I usually like to make my ATC's 'Technique' samples, so I added a Splash of Double Bugging (the purple CS) from the Technique Junkies newsletter. 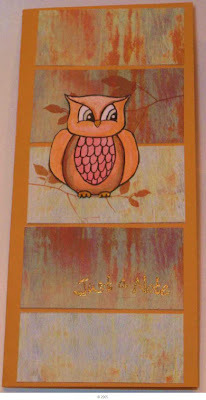 The BG behind the owls is called Milkpaint from the TJ newsletter- and there is a free tutorial on the TJ homepage- I did not add the lines as you can tell, and used More Mustard and Close to Cocoa. (If you cannot resist joining, please tell Pat I sent you!). My friend Kim called and asked me to spend some time with her today, and was interested in going to a SU workshop-which I rarely attend because of time. I do not see her nearly enough, so said sure. 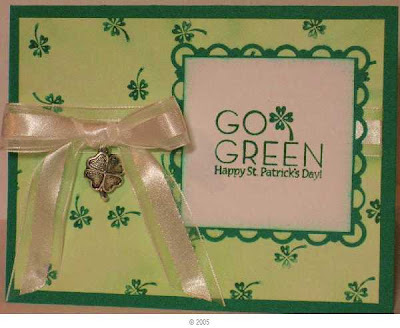 This is what we made- and I have to say I am thrilled with the Go Green card- is that not too cute? The SU demo that held the workshop, Pam- her SCS name is Churchmama. We had a great time. Thanks for stopping by today! We are expecting snow in Chicago today and tomorrow- I hear it is alot, so we'll see! Pamela at Firecracker Designs by Pamela is on Facebook and wants to have a celebration for reaching 100 members on the FCD FB page. Share the LOVE of FCD Celebration!!!! 1. Just for being an FCD FB member, you'll have a chance to win a 10$ gift card. To enter, all you have to do is join the FCD fan page, before Feb. 14th!! Pretty easy to win! 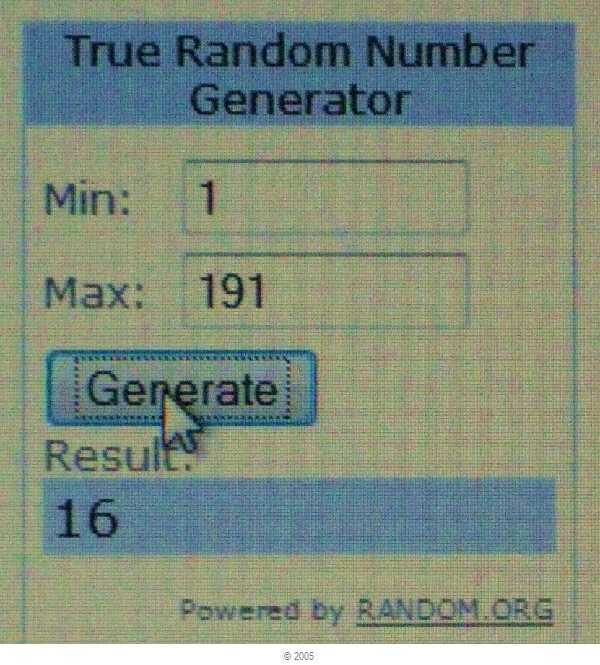 One randomly chosen member will win. 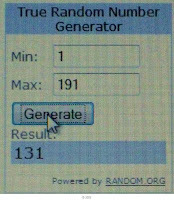 If we reach 150 members before Feb. 14th, we'll draw TWO winners! 2. We are having a contest! Create ANY piece of art that uses ANY FCD image you have, submit it to the fan art by uploading in thru a post on the FCD wall, and you are entered to win a 15$ Gift Card! 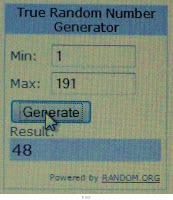 ONE entry per person, one randomly drawn winner will be chosen. Don't own any of our rubber? No problem! You can use an FCD digital to enter! AND to kick things off, I've uploaded TWO brand new freebies to the digi page, so EVERYONE can play!! What are you waiting for? Go get creating!! (link to digitals is here) Deadline is Feb. 13th! Drawings will be held on Feb. 14th!! Have a nice Saturday - I will be working tomorrow. It's funny, I am not sure if I would pick these colors if I were not Bloggers' challenged to, but I like the results! I wanted to use this Digital Image by Firecracker Designs by Pamela- I think it is so pretty.... And, I was inspired by a card I saw on a Blog-by Theresa Momber- you can see it Here. Theresa took her Copics and colored a strip so she would have colors that matched her card exactly. So, I decided to give it a go for my background which was going to be red- cause black and white would not work here, would they??? After I colored the BG, I painted Shimmerz on the smaller hearts-love that stuff! CAUTION- Shimmerz runs or bleeds on some digi's- do a quick test run on a second digi before you try this- AND, once you paint on shimmerz, you cannot color over it. Next, I took a Sakura gel pen and outlined all of the flourishes and the outside of the heart. 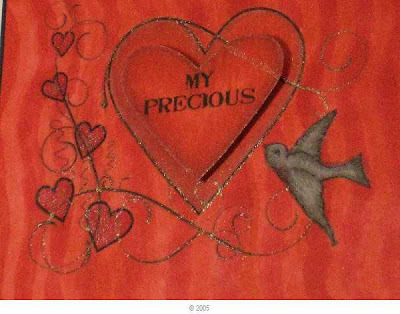 I used a sentiment from the digital freebie Conversation Hearts by FCD- scroll down..... 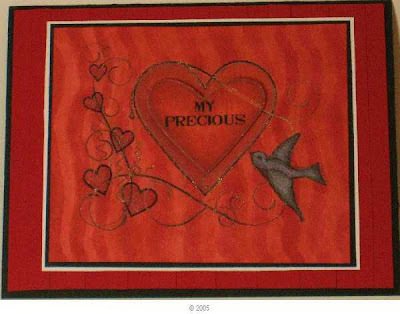 I cut out a the sentiment and cut it into a heart, then colored it in and popped it up on dimensionals. I colored using a feathering type stroke- first in red, then Grey, then red- I wanted a darker edge and a lighter center. Once I liked the look of the center heart, I added the Sakure gel pen to the outside of the sentiment heart. Colors used: R24, R27, R29, C2, C3, C5 I colored the bird in the grays and decided to try to outline the inside edges to give it dimension-instead of the outside outlining I usually do. The background is Black, then real red. The red is done in a Technique Junkies Technique called Faux Painted Paneling. I ripped a piece of card stock and just colored down a row at a time- hold your marker at an angle and use a thicker stroke on the edge with your new color to get a smooth line against the prior row, then finish the line in your circle strokes. 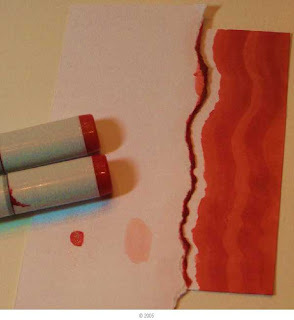 I think if you tried this in different colors, you would want to consider tearing a few pieces of CS together, and using a fresh piece for different colors so you would not get bleeding. I wanted to participate in the Clear Dollar Stamps color challenge as well- Red/Black and White. I colored just the clover on the stamp with my SU Glorious Green marker, and stamped it multiple times for the background. 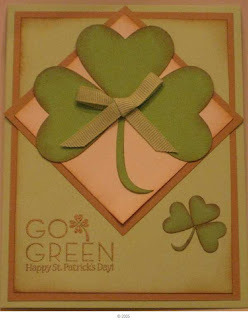 I like this clover- nicely done SU! 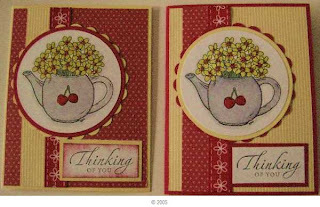 Anyway, stamped the sentiment, then punched out the SAB scallop punch and did the corners with the coordinating corner punch. I added a ribbon and a charm. 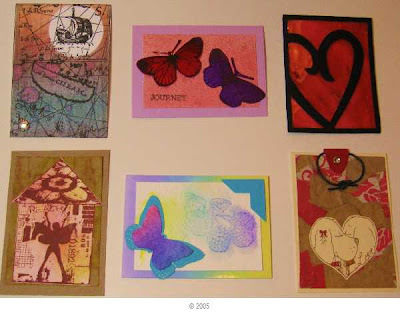 The TJ ATC swap is organized by Juliet Arrighi who is a multi-talented stamper and Artisan. Please stop by and say hello- she was featured on Digital Two for Tuesday today and has a fantastic project that she shared! Outstanding!!! 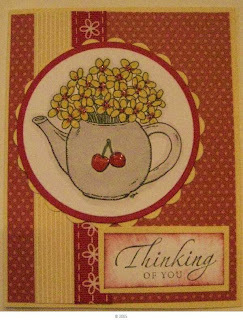 This is the card Juliet made recently that I commented on- how much I liked it- and it arrived in my mailbox- I just love it- the play on color on this card is very pleasing to me- and I will be posting this in my crafting room to admire! Thanks for stopping by! Hope you have a great week. 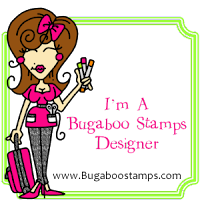 Watch for another Blog Candy this week- I am feeling very fortunate this Spring to have a loving family and a comfortable life-I only want for more stamping time! 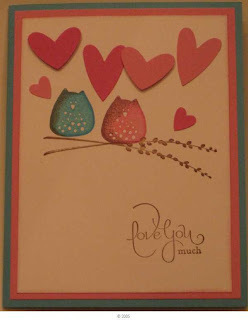 I found some fun 'stuff'' today- fun Valentines themed stuff- including mailboxes from target. Plus- this is post #125!!! I will be posting before the weekend.